If Obama’s audacity of hope called for a change, the audacity of imagination calls for action. With this in mind, we thought we’d talk about the “Maker Movement”; something that has been sweeping the world this past decade or so. Starting as a sub-culture representing the technology-based extension of the DIY culture, a maker is anyone who enjoys creating new devices and tinkering with existing ones. Going side by side the term “Innovation”, today there are innumerable initiatives to encourage this movement across the globe. There are “makerspaces”, “hackerspaces” or “Fablabs (fabrication labs)”, where machines like 3D printers, laser cutters, and other such technologies are made accessible for like-minded people to gather and share their knowledge and skill-sets. Events like “Maker Faires”, “Mini Maker Faires” and “Maker Fests” are conducted as huge scale celebrations for hobbyists, technologists, artists, engineers, etc (anyone interested in hands-on making) who get a platform to share their work with the public. Furthermore, there are also competitions like “makeathons” and “hackathons” where everyone from industry leaders to college students get together to create something crazy but useful overnight! “Learning as you build” is the core spirit. Sounds exciting, doesn’t it? Over the past year, INK has also jumped onto the bandwagon of maker madness. “INK Makers“, one of our impact programs, brings together promising student-innovators from top universities across India to compete in a frenzy of making across 48 hours. They showcase their projects and get an opportunity to win prizes, meet investors and obtain funding! Since January 2017, we have conducted 2 mak-e-athons at NIT Warangal and Manipal University respectively. Another 2 are coming up in the next month, at BITS Hyderabad and NITK- Surathkal! The culmination to these make-a-thons will be a full-fledged finale, where participating colleges battle it out to get the grand “Makers” prize (dates of the Finale to be announced. To learn more of the INK Makers program, please visit here). In short, there are some exciting times ahead for the INK folk! To share our enthusiasm, we thought it would be nice to round up some of our past INK talks given by inspiring (and quirky) makers, all up to interesting hijinks. Listening to them might give your heads and hands the urge to make as well! 1. Innovating for a bright, green future: Listen to INK Fellow and powerhouse maker Luke Iseman tells us how to look at pollution as an opportunity to innovate! 2. 6 formulas to help you innovate: MIT Media Lab’s Associate Professor Ramesh Raskar shares with us the’Idea Hexagon’ — a mental framework to aid the process of invention. 3. 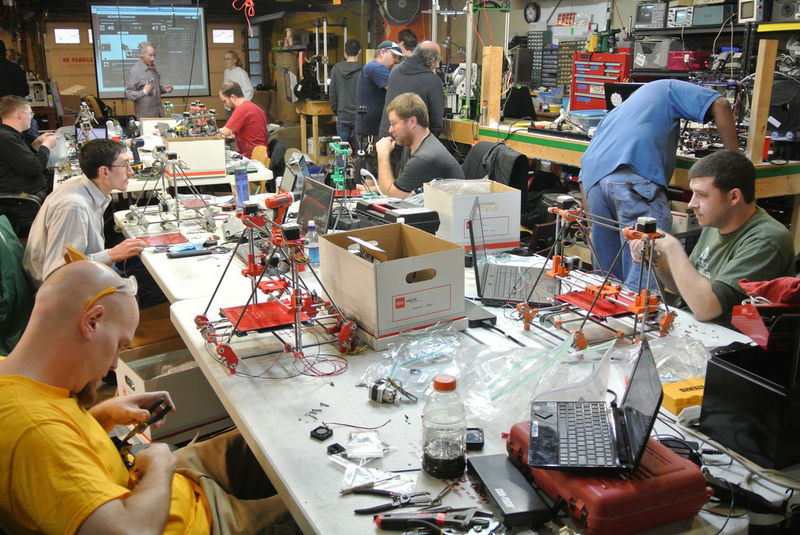 The hackerspace revolution: INK Fellow and and world traveler Bilal Ghalib is an expert on collaborative community spaces for makers and hackers. Let him take you on a tour of the hackerspace movement in the Middle East! 4. Practicing incidental sustainability: Looking towards the East, INK Fellow and Singaporean maker Veerapan Swaminathan tells us how he combines making with community sustainable practices in Singapore. 5. MIT Media Lab — from a container to a network: Director of the MIT Media Lab Joichi Ito, talks about inventing and his 9 principles which include ‘risk over safety’, ‘ practice over theory’, and ‘disobedience over compliance’. 6. Getting kids excited about electronics: INK Fellow and electronics tinkerer Shashwat Ratan talks about the lack of technology fundamentals in today’s schools, while he demos ElectroBricks — low-cost electronics kits that do not need any programming or soldering skills. 7. Intelligent shoes, smart rulers, and ink from pollution: Watch and listen to INK Fellow Anirudh Sharma describe his “chronic” inventions, which include Le Chal, a haptic feedback based shoe for the blind, Glassified, a modified ruler with digital functionality, and AIR INK.